3 for Intelligence: Colossals, Assssemmmmblllllllleeee!!!! That's not what I want to see across the table. The Archangel isn't coming out for some time, so I'm going to just go ahead and avoid people playing titans in my little skirmish game, haha! 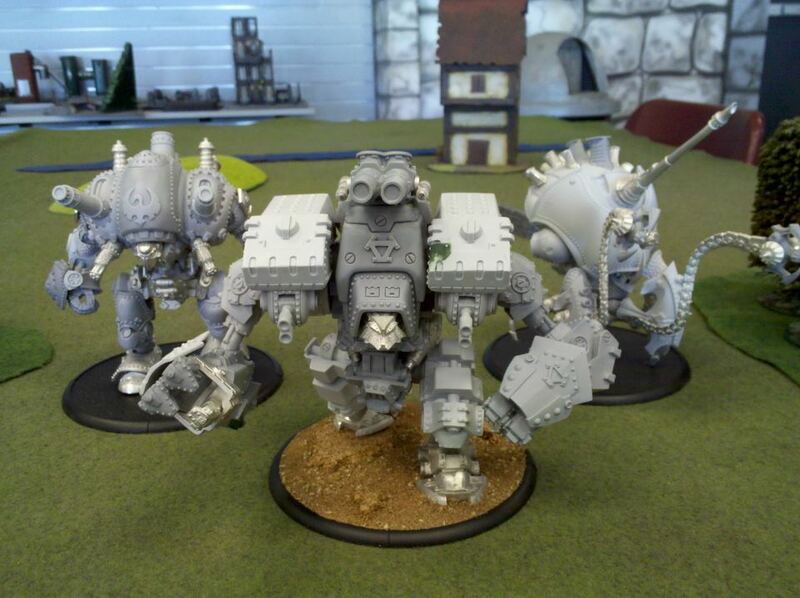 I like how the Khador one looks, but the other two leave a little something to be desired imo. The Stormwall looks like a big lightbulb and the Kraken has that big gun on it's head that makes it look like a japanese schoolgirls worst nightmare. The only one missing here is the mountain king. That guy looks boss. When you are the king of a mountain because you carry it on your back, you deserve respect. The best I could do is "backpack king" or "t-shirt king". Not nearly as impressive. His rules are a bit meh from what I understand, but my buddy assures me that they are pretty good. Basically with whelp shedding and snacking, he will stay alive forever unless your opponent can kill him in one shot. I do think the idea of these kind of super heavies in a supposed skirmish game is a bit weird, but PP has done a good job on them by making them appropriately costed and not ridiculously overpowered. But mostly, I can't wait to play with a giant dragon! C'moonnnnn Archangel!! !